I can't help quoting Mark Twain(Following the Equator) here - "Benares is older than history, older than tradition, older even than legend, and looks twice as old as all of them put together". Ofcourse there is something special about this city! Varanasi or Benaras is one of the oldest living cities on earth. The ancient name of Varanasi was Kasi. According to the "Vamana Puran", the Varuna and Assi river originated from the body of the primordial person at the beginning of time itself. The tract of land lying between these two rivers got the name Varanasi, one of the holiest pilgrimages. Day1: Why Varanasi - Well, you need to find it yourself! 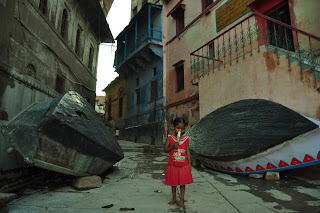 It raised a few eyebrows when I told my friends that I am going to Varanasi ... "Why Varanasi?" ... I did not answer. But I knew for what I am going to Varanasi. Varanasi got colors of life ... colors of my country ... India. We had our reservation in Mumbai mail - the train departed from Howrah in time. In its route the train touched my hometown. Sweet Home!! I know this route so well!!! We were traveling along a well known path. I never had a problem sleeping in trains ... neither this time. Actually I feel comfortable with the mild rocking journey. Mughalsarai, at 8:20 a.m. - surprisingly the train was not delayed. Just outside the station the auto rickshaw drivers almost started the third world war just to get us as passengers! Never thought we are that important. We decided for an auto rickshaw at last, and for Rs 200 it took us to the gate of the Kasi Hindu University. We had some food there and crossed the BHU gate to have a look at the Campus. Very soon we understood that we are too tired to walk and the burning sun is too much to tolerate. So we returned back to the gate within ten minutes and took another auto to the Dasaswamedh Ghat, arguably the most famous of the ghats of Varanasi. I can’t say I was really impressed with Varanasi at a first glance, was just trying to match with the pictures in my mind. It was not love at first sight. After leaving the auto soon we found ourselves in the banks of river Ganges – The Holy River. We didn’t have any booking as usual. I instinctively followed a gali - narrow lane, to find a shelter. We didn’t have to search much, and we were more than happy to see what we are getting. Two young lads are managing that Hotel – Rinku and Gaurav. We had a good time with them. The name of the area was pretty interesting, “Bangali Tola”, so it was a bit “at home” feelings for us. We didn’t want to waste much time, so after having a bath we left for the two most famous temples of Varanasi, Kashi Vishwanath Temple and Annapurna Temple. In most of the temples photography is prohibited. We had our lunch inside Annapurna Temple. It was a free lunch :P! In the evening Rinku had arranged a boat ride for us. First we went half an hour against the tide to “Harishchandra Ghat” and then we came back to “Dasaswamedh Ghat” to watch the famous Ganga Aarti from the river. With the passing time I started to feel it. Yes you need to feel Varanasi – the people there, the Galis the Ghats and above all the culture originating from there. I had heard so many stories about the fraudulent people of Varanasi. But surprisingly none came to my sight in the whole trip. I felt the exact opposite way about the Varanasi people. They are living with their cultures and beliefs. Until and unless you hurt their sentiment, they are good. In Varanasi, finish your dinner before 10 PM or it will be difficult to find a good restaurant or hotel. Although there is an old saying “Banaras mein koi bhukha nhi sota” – “Nobody sleeps with empty stomach in Varanasi”, but it is up to you that you believe it or not. Our first night in Varanasi was amazing. Ganga Arrti, colourful people from all over the world, Old Havelis, narrow lanes, temples everywhere and finally a sound sleep – everything was perfect. In my daily life no one can blame me as an early riser, but during my tours I don’t miss sun rises or sunsets. I missed it this time! It was already 7:30 AM when I wake up. Others were still sleeping and I left with my camera. Every moment so many incidents happen there in the ghats of Varanasi. I was sitting there on stairs, just watching, with the camera packed inside the bag. No click! The life continues to flow in Varanasi with me there as a silent spectator. Rinku also arranged our trip to Sarnath. On our way we saw a few more temples – I don’t even remember all, except the Durga Mandir and Original Bajrangbali Mandir. Leaving Varanasi first we had moved to Ramnagar fort. Just beside the river Ganges Ramnagar fort is quite picturesque. We spent good time there. From there we went towards Sarnath. I had a problem there. My contact lens got displaced and I lost it inside my eyes. The irritation stayed until I had removed it at the night. We had our lunch after returning back to Varanasi. It was late. Rinku stayed there with us during the full trip.We had a bad news after our lunch. A friend called and told that Kalka mail had gone through an accident and co-incidentally we had our return ticket booked in Kalka Mail for the next day. Several people died in that incident. We were not sure that the train is going to run for the next day or not. Throwing all these thoughts out of mind I went to the see the Arrti again in the evening. As I missed out earlier so I wanted to have a few real good shots of that event this time. At the end I was not disappointed. I remember the day we came to Varanasi, never thought we are going to enjoy Varanasi so much. It was an amazing experience to walk in the narrow lanes of Kashi, to enjoy the breeze sitting idly on the stairs of ghat, to watch the dancing sunlight over the waves, to watch the flow of life, which may have been flowing the same way, as it used to flow some 5000 years back. It is place where the line between myths and reality become thinner. Where mind tends to believe the existence of a power that drives this universe, drives us all. A never felt before spiritualism starts running inside the mind. Only Varanasi can make someone feel like that. The best place to enjoy sunrise in Kasi is from river Ganga on boat. I was in time to catch the first rays but a cloudy sky was threatening to ruin our plan. With confusion in mind we started our boat("nao") journey and after playing with our mind for a while the Sun came out of the clouds. We were preparing our mind for the return ... We had our lunch inside the temple again. We didn't have much option to spend time, so we took an auto rickshaw and went to the "New Kashi Viswanath" temple inside Kashi University. Not many visitors during afternoon and we took a nap there. Before leaving Kashi we went to the "Ashi Ghat". The 80th and last of the ghats. The atmosphere was magical. 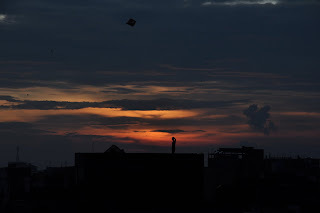 We waited there till the sunset... then took an auto from there to Mughalsarai. The train was almost 7 hours late ... and how we spent those hours in station is another story, story of our sufferings. But this is not the right place to share that experience. Hey, I deleted the prev comment, because I did not know that you have become quite the internationally acclaimed photographer(at least in Flickr). I loved some of the photos here. I would have told you that you have done a great job, an excellent job rather, but what's the use? You and the whole world knows that already...just keep them coming brother !! Ajkei kotha hochhilo Saggy (sagarika) sathe tomake niye! I am glad that you like :) ... photo tolata uddeso chilo na ...ghore thakte ageo bhalo lagto na, ekhono lagche na. Rajasthan chollam 13th August. The photos were excellent too !!! Its a great feeling to be in touch with a world class photographer everyday in office !!! This will be of good help to travelers. Varanasi is a good place to see here which is the site of many gods , many come from far away. Varanasi is the very important city of Varanasi is the very important city of Hindus because Varanasi was found in lord Shiva . The Pandavas, the heroes of the Hindu epic Mahabharata, are also said to have visited the city in search of Shiva to atone for their sin of fratricide and Brāhmanahatya that they had committed during the climactic Kurukshetra War. It is regarded as one of seven holy cities which can provide Moksha; vanarasi as also known as banaras, kashi. 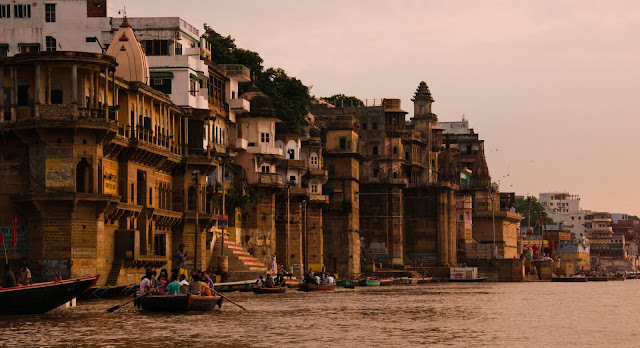 it is north Indian city on the bank of holy river Ganga in uttar pradesh Varanasi grew as an important industrial center, famous for its muslin and silk fabrics, perfumes, ivory works and sculpture. The Buddha is believed to have founded Buddhism here around 528 BC when he gave his first sermon, "The Setting in Motion of the Wheel of Dharma", at near by Sarnath. Varanasi Tour has many attraction like Aghor Peeth, the Alamgir Mosque, the Ashoka Pillar, the Bharat Kala Bhawan (Art Museum), the Bharat Mata Temple, the Central University for Tibetan Studies, the Dhanvantari Temple, the Durga Temple, the Jantar Mantar, the Kashi Vishwanath Temple, the Sankat Mochan Hanuman Temple, the Mahatma Gandhi Kashi Vidyapith, the New Vishwanath Temple on the BHU campus, the Ramnagar Fort, the Riverfront Ghats, the Tulsi Manas Temple. Delhi Agra Jaipur Varanasi Tour is the most populer Destinations in India.